Gaming boffins from the Massachusetts Institute of Technology (MIT) have developed a Wii-style videogame designed to help visually impaired players virtually thrash their 20/20 competitors. AudiOdyssey sees the player become Vinyl Scorcher, an up-and-coming DJ on a mission to get clubbers shape shifting with merriment. 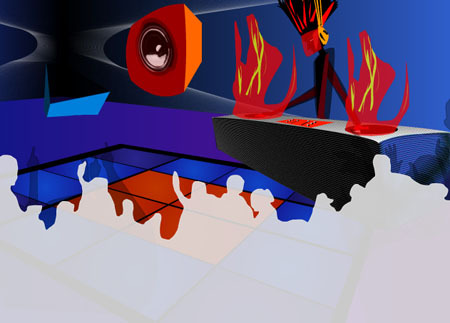 Players must swing the Wii’s remote in time with the virtual beat, but as Scorcher lays down more phat beats, gamers must continue to swing the Remote in time so that party goers don’t desert the disco. The game was developed at MIT’s Gambit Game Lab in Singapore, as part of a project that hopes to help visually impaired and sighted players enjoy the same level and quality of gameplay. But the game also works with a regular keyboard, so that those with 20/20 vision or without a WiiMote can still play the game. AudiOdyssey can be downloaded here. It runs on Windows PCs. To use the WiiMote, the PC must have Bluetooth on board.